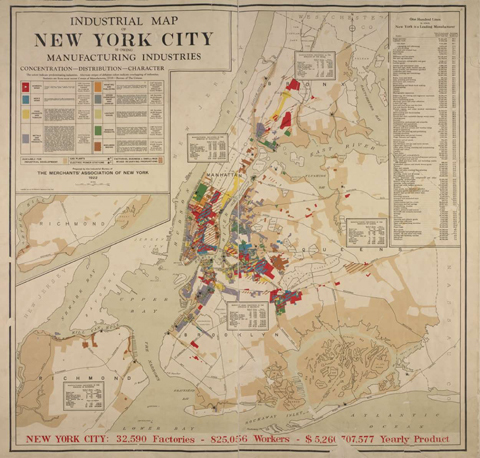 The below Industrial Map of New York City created in 1922 by the Merchants' Association's Industrial Bureau details in color coding the concentration, distribution, and character (or type) of manufacturing. The complex patchwork, especially in Manhattan and Brooklyn, highlights major industries of the 1920s: women's and men's clothing, food preparation, printing, metal products, and chemicals, paints, and varnishes. These patterns of proximity tended to occur naturally, even though, until the city's first zoning ordinance of 1916, factories could locate anywhere in the city. 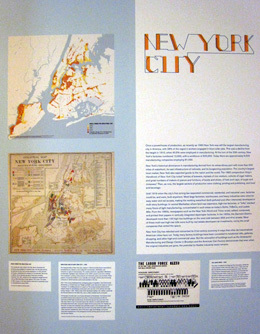 Collection of the New York Public Library, Maps of New York City and State. After 1916, zoning established two overlapping types of regulation: Use (Commercial, Residential, or Unrestricted) and "Height and Bulk" zones that set the maximum mass or "envelope" of a building allowed on a given lot. The zoning envelope influenced the setback shape for tall buildings constructed in the city from 1916 until the next major zoning change in 1961. Whole areas that developed rapidly in the 1920s, in particular the Garment District in the West 30s, were in effect sculpted by the zoning law. Zoning kept industrial uses out of areas delineated as Residential. Commercial zones proscribed industry that produced loud noise or noxious pollutants, but did not otherwise prohibit light manufacturing. Unrestricted was just that, and most of the City was zoned as such. It was land values-- the reflection of market demand-- that principally determined uses: zoning law helped reinforce and protect the "highest and best use" of urban land. Industrial uses generally located on the cheapest land. The significant exception to this market rule occurred in the areas where the tallest "vertical urban factories" exploited the value of the land in high-rise buildings, such as the skyscraper newspaper headquarters and printing plants and the loft towers of the Garment District. This composite map of New York City above illustrates the shrinking area available for industrial uses over the past century,as delimited by the City's zoning regulations. In 1916, the first zoning law established the category of "Unrestricted" (the areas in yellow), which allowed any type of land use, including industrial. The 1961 revisions of the regulations categorized the uses as Manufacturing in three types of "M" zones. The areas in dark orange on the map indicate areas lost to residential zones in reclassifications since 2002. 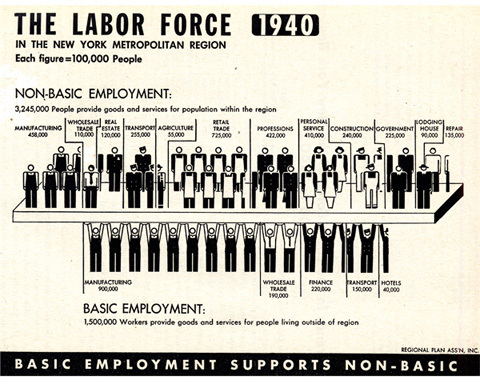 "The Labor Force in the New York Metropolitan Region, 1940. Basic Employment Supports Non-Basic." From: The Economic Status of the New York Metropolitan Region in 1944, page 7. �Regional Plan Association, Inc., Pictograph Corporation. This chart, compiles by the Regional Plan Association, details the various sectors of New York City's labor force in 1940, when the City was still the country's principal industrial center. The lower range of figures represents basic employment and illustrates the manufacturing jobs-- 60% of total jobs-- that produced goods exported to national and international markets. The upper range of figures show the variety of sectors comprising the local economy, or non-basic employment, and represent the goods and services produced and consumed within the city. NEXT: R. HOE & CO.